The bus tours are usually about 3 hours long and the walking tours are about 2-3 hours long, but we can customize times and routes as needed. If you have a group that is interested in booking a bus or walking tour, let us know and we can send you more detailed information. We’re looking forward to participating in the YIMBY Festival this Saturday, Oct. 31 from 11am-3pm. Free admission to all. The “Yes in My Backyard” Festival will feature 104 non-profit groups who are having fun promoting positive change in Toronto: social, environmental, heritage, planning, arts, parks, social media, and so on. If you haven’t met anyone from First Story yet, come say hi to us! And bring your questions and suggestions. And join us for our 30-minute presentation from 2:30-3pm. We’ll be giving a sneak preview of our first-ever Winter Walking tour, planned in collaboration with Toronto Green Community and their Lost Rivers project! WHERE: at the Ted Rogers School of Management at Ryerson University (55 Dundas St. W). Amazing Events not to be missed this summer! 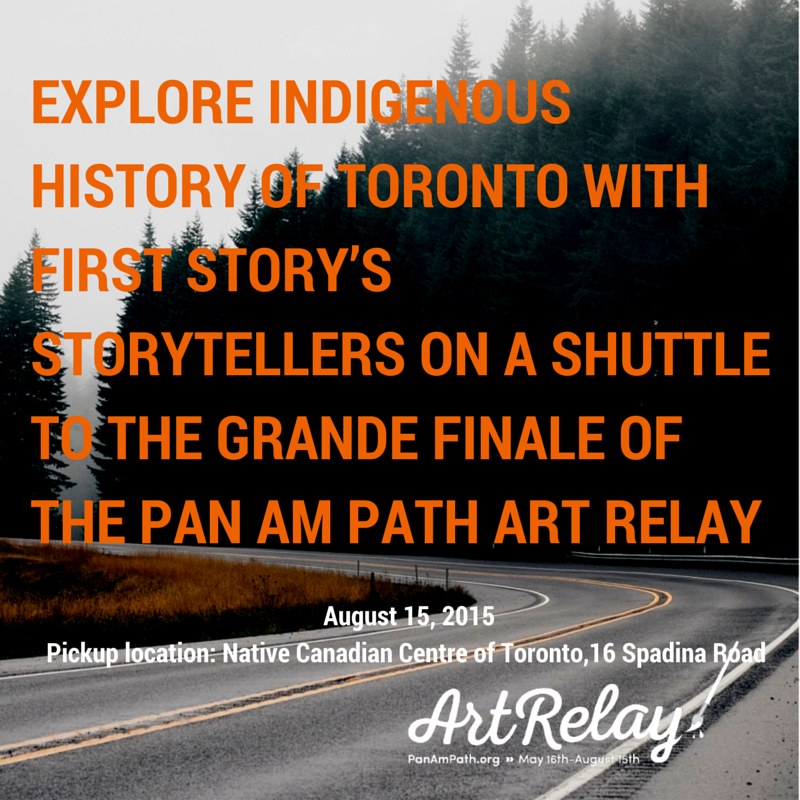 This is an amazing summer in Toronto for experiencing Indigenous cultures at multiple events! We don’t think there’s ever been a greater opportunity to meet more creative people from First Nations, Métis and Inuit communities across Canada. Last month, First Story Toronto hosted daily tours of Indigenous Toronto for an entire week, and capped it by hosting an unprecedented TALKING TORONTO TREATIES event. And elsewhere, the ABORIGINAL PAVILION is in full swing on the grounds of Fort York and and later at Harbourfront Centre. This 19-day Indigenous arts, culture and sports festival runs concurrent to the 2015 Pan Am/Parapan Am games from July 10-26 and August 7-9 this year. From Main Stage musical performances to dance, theatre and family programming on the Small Stage, from visual arts and traditional crafts workshops to artist talks, film screenings, a curated exhibition, there’s much to see and do! Check out the Aboriginal Pavilion’s SCHEDULE here: http://www.alppavilion.ca/ And it’s all FREE! And then comes Planet IndigenUS 2015: 300 artists over 10 days from from July 30-August 9, co-hosted by Harbourfront Centre in Toronto and the Woodland Cultural Centre in Brantford. Planet IndigenUS is a global exploration of contemporary Indigenous civilizations. Since 2004, this bi-annual festival has been raising public awareness, breaking stereotypes and fostering a cross-cultural dialogue between Canadians. 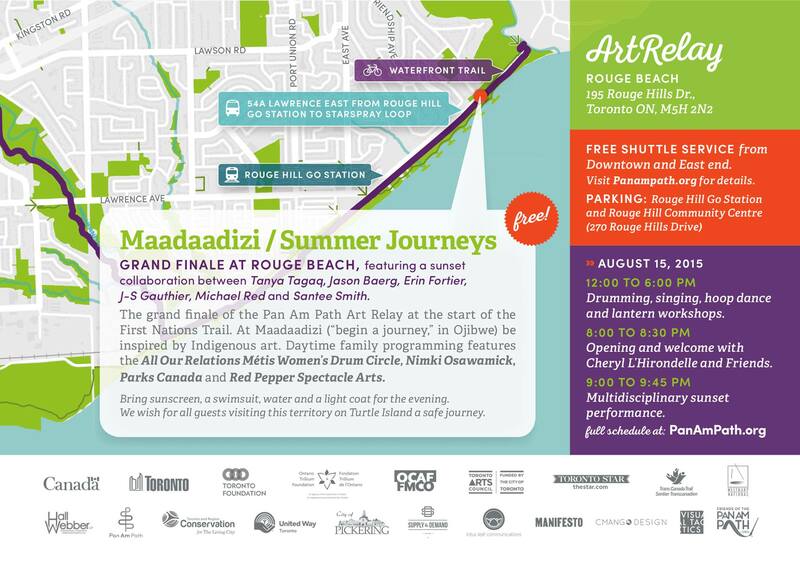 Enjoy music, art, food and ideas from First Nations communities across Canada and Indigenous peoples around the world. Let’s all support these incredible opportunities to enjoy and learn this summer, so we’ll encourage the artists and producers to return in the future!